36 PEER TO PEER: THE QUARTERLY MAGAZINE OF ILTA | SPRING 2016 CASE STUDIES iTimeKeep Is a Keeper! Recruiting a Pilot Group iTimekeep is a mobile app that would enable our timekeepers to track and enter time on the go without needing to be logged on to our network, and it integrates seamlessly with our current billing system (Elite). This sounded like an incredible productivity tool, but we had to get buy-in, make sure it worked and confirm the masses found it as valuable as advertised. We started with the requisite pilot group. We recruited folks with a short survey asking about the type of smartphone they used and whether they entered their own time. From those who responded with interest, we selected 35 for the pilot group (our firm has 250-plus aorneys), predicting that some wouldn't participate. The pilot was announced, and immediately our participants started downloading the app to their phones and tablets (you can also access iTimekeep from the desktop). It was not just the app- savvy first-year associates, either — senior partners were also off and running, and with no training. It was remarkable! Gathering Feedback About a month into the pilot phase, we surveyed the group for feedback using four short prompts: » How user-friendly is iTimeKeep? » What do you love about iTimeKeep? » What do you hate about iTimeKeep? » Would you recommend iTimeKeep to a colleague? From their responses, it was clear that the app was a keeper. 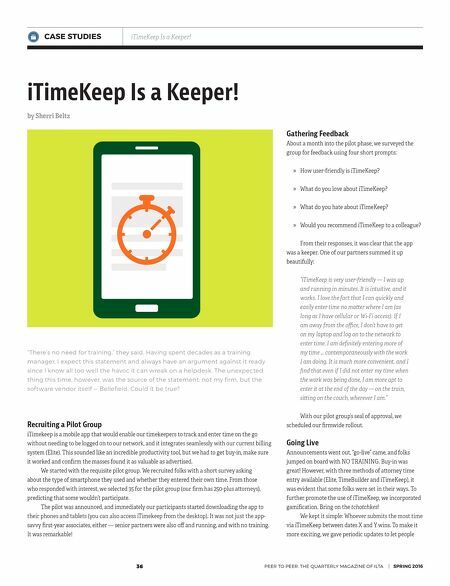 One of our partners summed it up beautifully: "iTimeKeep is very user-friendly — I was up and running in minutes. It is intuitive, and it works. I love the fact that I can quickly and easily enter time no maer where I am (as long as I have cellular or Wi-Fi access). If I am away from the office, I don't have to get on my laptop and log on to the network to enter time. I am definitely entering more of my time … contemporaneously with the work I am doing. It is much more convenient, and I find that even if I did not enter my time when the work was being done, I am more apt to enter it at the end of the day — on the train, siing on the couch, wherever I am." With our pilot group's seal of approval, we scheduled our firmwide rollout. Going Live Announcements went out, "go-live" came, and folks jumped on board with NO TRAINING. Buy-in was great! However, with three methods of aorney time entry available (Elite, TimeBuilder and iTimeKeep), it was evident that some folks were set in their ways. To further promote the use of iTimeKeep, we incorporated gamification. Bring on the tchotchkes! We kept it simple: Whoever submits the most time via iTimeKeep between dates X and Y wins. To make it more exciting, we gave periodic updates to let people "There's no need for training," they said. Having spent decades as a training manager, I expect this statement and always have an argument against it ready since I know all too well the havoc it can wreak on a helpdesk. The unexpected thing this time, however, was the source of the statement: not my firm, but the software vendor itself — Bellefield. Could it be true? by Sherri Beltz iTimeKeep Is a Keeper!